Creation: I-664 was requested by Virginia in Aug 1968 (CTB) when Congress added 1500 miles to the interstate program. In Jan 1969 (CTB), FWHA approval was granted provided the section of I-64 from I-664 Hampton east 11.5 miles to US 460 Wards Corner was removed from the interstate system. Adjustments:In March 1969 (CTB), it was decided to not cancel I-64 across the HRBT but instead build the entirety of I-664, using state funds for the distance not covered by the 9.2 miles the I-664 approval/I-64 rescision would have netted. I-664 would therefore run from I-64 Hampton to a point near Craney Island, then be interstate standard state highway to Bowers Hill. In April 1971, the CTB was informed that I-664 had been designated as approved by the FHWA to run from I-64 Hampton to Craney Island. The 1974 Official map is the first to show dotted lines for I-664, which were from US 17 north to Newport News. The March 1978 CTB indicates that the FHWA allotted the 1.7 miles needed to get I-664 to the south shore of the crossing, which by then had been moved off of Craney Island to its present routing. The State would still build the remainder as interstate standard to Bowers Hill. In 1983, per Scott Kozel's website (contains much more detail on the I-664 saga), Virginia successfully petitioned the FWHA to use "4R" funds normally used for construction/maintenance of existing interstates on building I-664 south of the Hampton Roads Crossing. The dotted lines south of the crossing showed as VA 664 on the 1980-89 Official issues. In June 1981 (Kozel), I-664 opened from I-64 Hampton to Powhatan Pkwy. In January 1983 (Kozel), I-664 was opened to Roanoke Ave. The interstate to this point had been built directly on top of the Newport News Connector Road, which had a partial interchange at then-VA 168 in the late 1950s and ran south as a super-2 with full access control to the intersection of today's Aberdeen and VA 143 Victoria. There was one partial interchange at Aberdeen Rd which used to end at VA 351 prior to the I-664 construction. There was only a long overpass of the Connector over VA 351 and the railroad with no access. In Sept 1987 (Kozel), I-664 opened south to 35th St. In Jan 1988 (Kozel), I-664 opened south to 26th St. In Jan 1991 (Kozel), I-664 opened south to Terminal Ave. In Jan 1992 (Kozel), I-664 opened from Bowers Hill to VA 135. This had been previously been designated to be part of the US 17 ALT Belleville Connector from 1966-88. 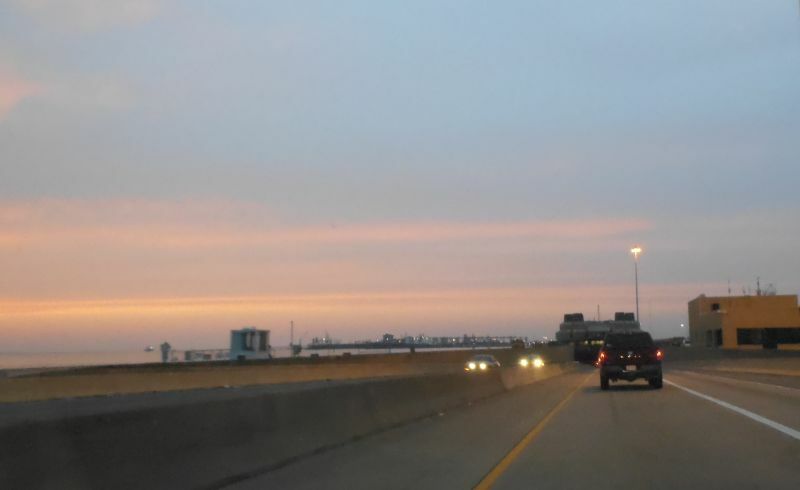 In April 1992 (Kozel), the Monitor-Merrimac Bridge Tunnel across Hampton Roads opened, connecting I-664 from VA 135 to Terminal Ave. Improvements: I-664 opened as 6-lanes from Exit 1 to Exit 6 and is 4-lanes everywhere else. Diamond interchanges in Chesapeake are built with future full cloverleaf expansion in mind. For some reason SR numbers are used on BGSs at Pughsville Rd and Dock Landing Rd in Chesapeake, decades after these designations were abolished. Comments: Forms the west leg of the Hampton Roads Beltway which is useful for through travelers to locations like the Outer Banks of NC. The tunnel is different from other Virginia tunnels in that it is in "binocular" sections. Each piece of the tunnel was built elsewhere with the NB tube and the SB tube built as one piece. Then all the pieces were sunk in place and fused together. I-664 is one of only two routes in VA which could conflict with a secondary highway number but now that Suffolk has abolished theirs, no problem exists with 664. I-664 totally blows off VA 191, VA 351, and VA 415. Both Froggie and I think I-664 should be extended around to the I-64/264 interchange in Kempsville to get rid of the I-64 wrong direction mess.